Earlier this month we launched a great new website for Sunridge Community Church in Temecula as part of Sunridge’s Volunteer Web Team. In total, the project took about 8 months and was a collaborative effort including 9-10 volunteer team members from designers, programmers, project managers, copywriters, editors and data entry folks. We transitioned the old website which included less than thirty pages to a new platform with more than 300 pages. 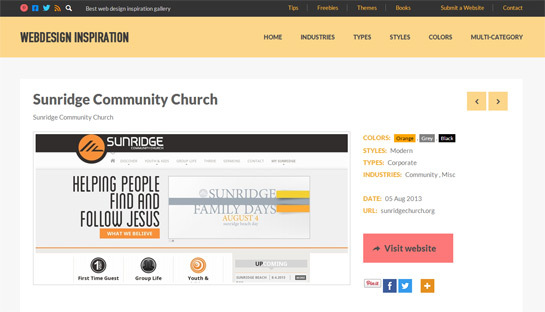 In just a few short weeks, the Sunridge Church website has been featured on 7 website design, CSS and HTML5 galleries. Web design galleries are used by designers for inspiration and to spotlight innovative, inspirational and modern examples of recent projects by companies worldwide. Inclusion in these galleries is not easy to achieve. For example, WebDesign Inspiration only includes about 100 websites per month in their international gallery.